Ever wondered what it is like to trade with an Australian binary options broker? The HighLow binary options brand is owned and operated by HighLow Markets Pty Ltd, an Australian derivatives and forex brokerage company. The company is licensed and regulated by the Australian Securities and Investment Commission (ASIC), and operates with AFSL license number 364264. The company is based in Sydney, Australia. The company, which was incorporated in May 2010, is the brainchild of industry professionals. The HighLow trading app can be downloaded on the Google Play store (Android devices) as well as the Apple Store (iPhones and iPads). Despite the new Apple policy of discontinuing support for binary options apps, the HighLow trading app is still listed for downloaded on the app store. Traders can open a free and unlimited demo account with $10,000 in virtual funds to enable them practice binary options trading without risking any money. There is an option trading schedule which details the trading hours of each binary options asset listed on HighLow. HighLow is simply put, one of the best binary options brokers in the business. Traders who use HighLow can be assured of transparency and a great trading experience. ASIC has very restrictive policies on who can trade binary options in Australia. Therefore, traders from many countries cannot open accounts with HighLow. HighLow is regulated and licensed to provide binary options derivative brokerage services by the Australian Securities and Investment Commission (ASIC). ASIC is the regulator of all financial markets in Australia. 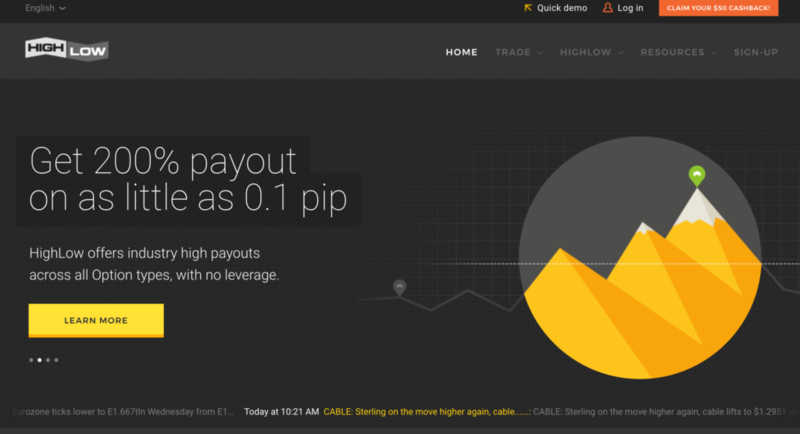 Can I trade with a binary options robot on HighLow? At the moment, it is not possible to trade with binary options robots on HighLow. However, in such a dynamic market, nothing can be ruled out. Can I trade binary options on my smartphone with HighLow?